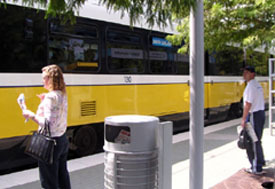 “This significant ridership milestone is part of a multi-year trend as more and more Americans ride public transit to get to destinations important to them, while realizing the benefits of saving money and avoiding congestion,” said William W. Millar, president of APTA. Light rail had the highest percentage increase among all modes, the association reported, with a 5.6 percent increase in ridership last year. Some light rail systems showed double digit increases in ridership: San Jose (36.6 percent); Minneapolis (18.4 percent); New Jersey (20.1 percent); Saint Louis (16.2 percent); Philadelphia (10.8 percent); and Salt Lake City (14.2 percent). As a guy born and raised in White Plains, a railroad suburb north of New York City, I never understood the cultural reluctance to rail outside the major cities of the East Coast. My buddies and I used the Metro North line to get into the city. I rode Amtrak to Philadelphia and the Paoli local commuter train from 30th Street Station to get to college in Haverford, a Main Line suburb. After graduation I lived in Boston, Charleston, and Washington and regularly rode Amtrak to New York, where my employers were based. Riding the commuter lines and Amtrak reduced my costs for maintaining a car, and when I left Washington in 1993 the precipitous rise in the value of my Bethesda home was largely the result of its proximity to the Medical Center stop on the Washington Metro’s Red Line, about a mile walk away. Now there’s mounting evidence that many more Americans who were never raised to ride commuter rail lines are growing more comfortable with this transportation mode shift. A major national infrastructure investment in rail construction needs to be part of the energy, environmental, and national security platforms of every candidate for the presidency. There’s nothing about many more miles of rail in the United States that doesn’t make plain sense.